SHOOTING STAR: Our product is a BB machine gun shooting gallery, which has been around since 1939. This is a strong game at parks, carnivals and fairs. Everybody likes to shoot and when they see the 100 shot sign they think they can't lose, also they have fun trying. It is a fun game that is both safe and economical to operate with good results. We have been making galleries, maintaining them with parts, repair and supplies for over 35 years. It is a strong game that holds gross over the years. We are proud of the gun that is sold worldwide and will last you for 30 to 40 years. 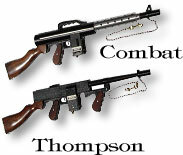 The games come in 2, 4, 6 and 8 gun game units. CONTROL: You have control of the Operator by a count of the loading tubes as well as numbered targets. That gives you an exact money count. QUALITY: The gun has our guarantee and it can last you at least 30 to 40 years with simple proper maintenance. Many have already done this. AIR SUPPLY: Compressor is a 2 stage =140 to 165 lbs.=1 cu. Ft. of air for 100 shots. MAINTENANCE: VERY SIMPLE! Just keep them oiled and clean. Repairs are simple with the assistance of the manual and supplied repair parts kit, or, send Main Block in for same day repair. BACKGROUND: Feltman, in Coney Island, NY, invented the gun. We operated there for many years under his name then moved to NJ and changed the name to SHOOTING STAR . . . this name is more appropriate. CHALLENGE: Can you find a game with a better price, made better, or, last longer - while maintaining a consistent profit over a longer period of time? !